We are now on the stage of being a tennager. Learning how to be, with ourselves and with the world in general. We have to fall for raising up again and try to fit in our society. We need someone to look up at. And in general, we look up to celebrities. The boys usually are influenced by athletes from football and basketball. Of course there are girls who love football! But I think that the most common celebrities that influence us are singers, actors and actresses and clothing designers. The problem is that we might overwhelme that feeling of "who I want to look up to" until it is transformed in a "they are my life". It may sound childish for some adults, but sometimes if we aren't in our best moments and we feel that nobody is going to understand us, we have to rely on somebody (platonic or not). I think that it's in that point when you start to feel identified into some fandoms. You find other girls like you that might have the same problems ( or maybe not) but you have the same solution: you know that he, she or they are going to make you feel more relaxed. I can understand this, because I'm a tennager too! But what I will never understand it's the urge that some people have for wanting to know everything of their idols. Why do you need to know the shoe size of your idol? Why is so important knowing what are they doing every minute of their single lifes? It's not necessary. It souldn't be like that. We are overreacting. We can show our love for our idols in such a different ways. We souldn't do this kind of meetings where one hundred of fans start to scream walking through the streets. What are we trying to show there? Being in a fandom it's such a great experience, but there should be limits. We have internet to use! And (if we are speaking of singer celebrities) we can shout out lout in concerts! In my case I considere myself a directioner (from the famous boyband One Direcction) , but I take it like a personal thing. No one needs to know it, because it's not necessary, for me it's a way for disconnecting, at least, from highschool! 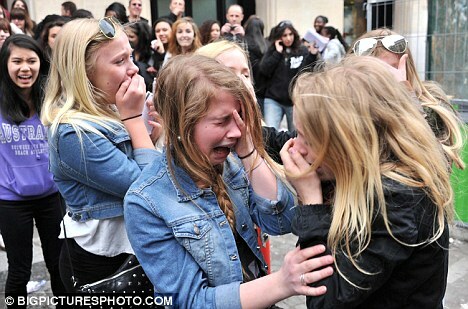 A group of fans crying because they saw their idol: Justin Bieber.